Full-term newborns sleep, on average, 16 hours or more per day. During this stage, sleeping patterns are unpredictable and how much daytime and nighttime sleep your baby gets will be varied. By 3 months, most babies sleep about 13 hours per 24 hour period. On average, most 3 month old babies will sleep 8.5 hours at night and have 4.5 hours of naptime per day. 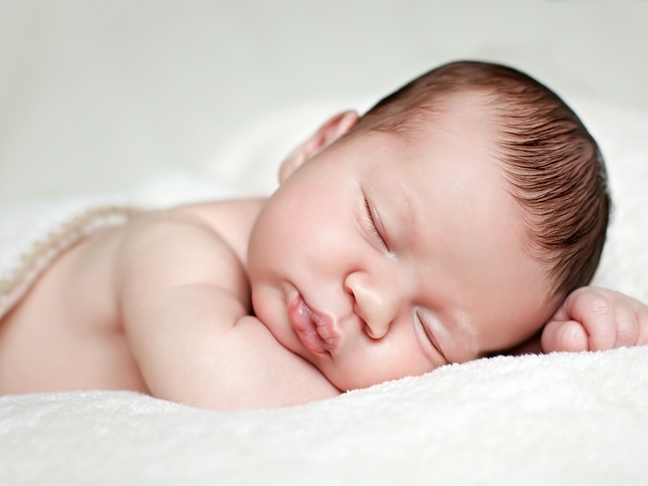 By 6 months, most babies sleep about 12.5 hours per 24 hour period. On average most 6 month old babies sleep about 9.25 hours at night and have two naps totaling 3.25 hours per day. By one year, most babies sleep about 11.75 hours per 24 hour period. On average most one year old babies sleep about 9.75 hours at night and have two naps totaling 2 hours per day. At around 3 months of age, babies can start to be put on a sleep schedule and by 5 months, most healthy full-term babies should be sleeping through the night. To help your baby get on a solid sleep schedule, establish a consistent nap time and bedtime. Most babies seem to nap around 9-10 am and then around 12 or 1 pm. Babies should be in bed for the night around 7 pm. To maximize your baby’s sleep it’s important to help your baby develop healthy sleep habits. One way to help your baby develop healthy sleep habits is by creating an environment that is conducive to sleep. A dark, cool room (68-69 degrees F) and a fan can help creative a soothing environment. Your baby’s sleep space should be separate, but close to you during the first 6 months or longer. A co-sleeper that attaches to an adult bed is a good option. It’s also important to put your baby in his safe sleep space while he’s drowsy, but not yet asleep so he learns to fall asleep on his own. Making sure that your baby gets enough sleep each day will help assure that both you and your baby are well rested and able to enjoy each day together. Canary Melon and Strawberry Puree for BabyI Heard Crying Can Be Good For My Baby, Is That True?